Will you watch the Winter Olympics this month? The graph presents data on Winter Olympics TV viewership in selected emerging markets worldwide 2014. 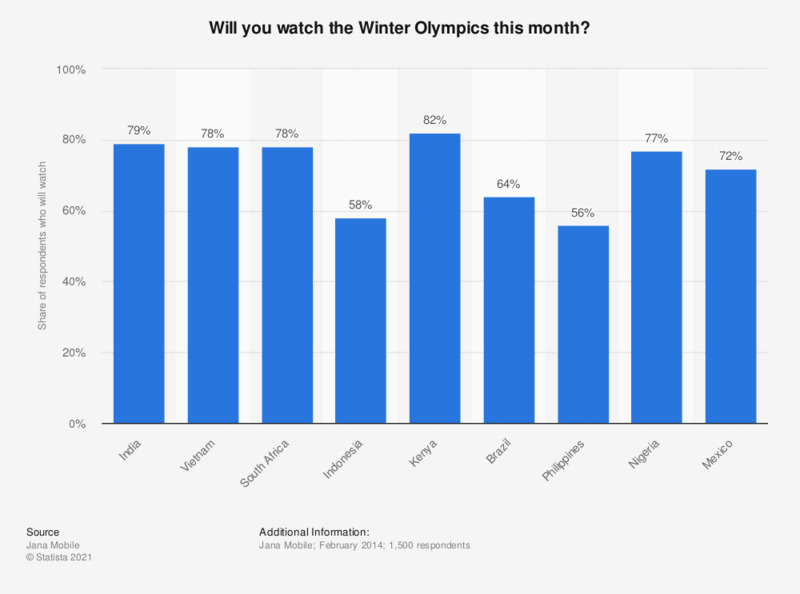 During a survey, 56 percent of respondents from the Philippines stated they would watch the 2014 Winter Olympics on TV. Statistics on "Rio 2016 Olympics"
Media used by Olympics followers to follow the 2016 Summer Olympics in the United StatesMedia used to follow the 2016 Summer Olympics in the U.S.
Do you think the International Olympic Committee made a good decision in selecting Rio de Janeiro to host the Summer Olympic Games? Do you expect the Summer Olympics in Rio de Janeiro, Brazil to be successful or unsuccessful? Thinking about the Summer Olympics this year, how much of the games do you expect you will watch? How much confidence do you have that all stadiums and event locations in Rio de Janeiro will be completed before the games start? How concerned are you about the possibility of Olympic athletes contracting the Zika virus? How big of a risk do you think it is that Americans traveling to Brazil for the Olympics will bring the virus back to the United States? Which Winter Olympic events will you watch?